Review: Second time around for Thomas Werner's most recent outing under the Dynamik Bass System alias, which first hit stores two years ago. We're particularly enjoying A-side "Teleprompter", which brilliantly joins the dots between snappy '80s club electro (think Dynamix II or Afrika Bambaata), vocoder-fired electrofunk, stuttering New York electro and the revivalist electro-boogie brilliance of Artificial Arm. 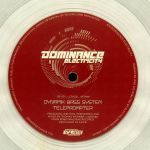 On B-side "UR My Destiny", Werner moves further towards freestyle and electrofunk territory, wrapping brassy synth-horns and ear-catching TR-808 cowbells around a killer synth bassline and more robotic vocoder vocals. Throw down that square of lino, flex your muscles and get breakdancing.